The svelte and rugged Vector Cup Holder prevents beverages from tipping over and spilling onto nearby electronic devices or other items. 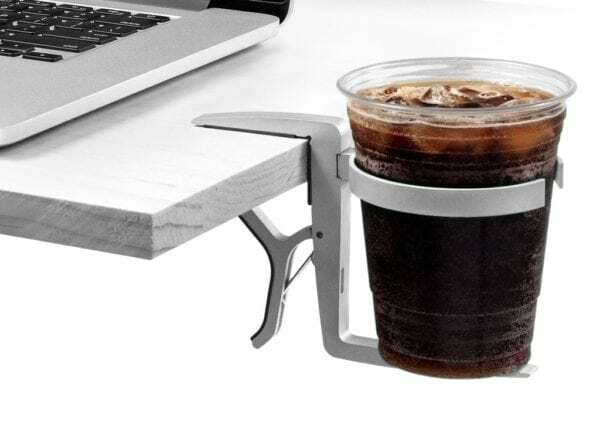 By taking the beverage container off the desk altogether, the Vector Cup Holder not only prevents catastrophes but also frees up workspace on desks, airplane trays and those too-small coffeehouse tables. And, unlike other cup holders, the lightweight Vector Cup Holder is truly portable. The Vector Cup Holder is the ultimate travel accessory. Easy and fast to deploy, easy to pack up and easy to take with you everywhere you travel.